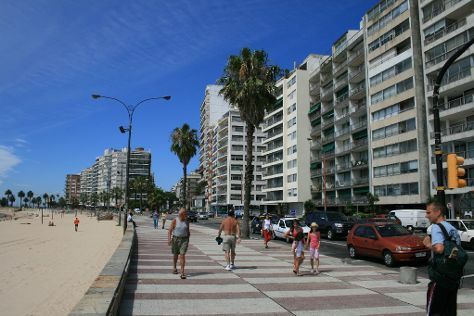 To find where to stay, reviews, other places to visit, and tourist information, you can read our Montevideo trip planner . Rio de Janeiro, Brazil to Montevideo is an approximately 5.5-hour flight. You can also drive; or take a bus. Expect slightly colder temperatures when traveling from Rio de Janeiro in April; daily highs in Montevideo reach 26°C and lows reach 16°C. Wrap up your sightseeing on the 18th (Thu) early enough to ride a ferry to Buenos Aires. Kids will appreciate attractions like Parque 3 de Febrero and Recoleta Cemetery. Get some historical perspective at San Telmo and Recoleta. And it doesn't end there: wander the streets of Puerto Madero, make a trip to Casa Rosada, admire the landmark architecture of El Ateneo Grand Splendid, and appreciate the extensive heritage of La Boca. To find more things to do, reviews, where to stay, and tourist information, read our Buenos Aires trip itinerary planner. Getting from Montevideo to Buenos Aires by ferry takes about 2.5 hours. Other options: fly; or take a bus. In April, daytime highs in Buenos Aires are 26°C, while nighttime lows are 19°C. Wrap up your sightseeing on the 21st (Sun) to allow time to travel back home.